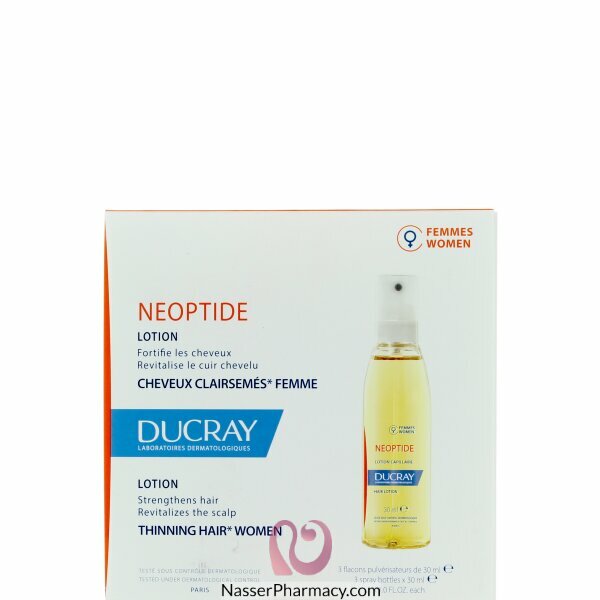 Ducray Neoptide Anti-Hair Loss Treatment is specially designed to curb female chronic hair loss. It stimulates hair growth through its formula with Tetrapeptid + Neoruscine + Nicotinamid + GP4G. Neoptide hair loss lotion works directly on the hair follicle to stimulate the anagen phase (hair growth phase). The amino acids concentration promotes the proliferation of the hair' growth phase. Chronic hair loss is inhibited. Moreover, through cutaneous microcirculation, the entire hair shaft is stimulated; this results an increased hair lenght. Neoptide restarts and stimulates growth. All of hair is thus stimulated, hair loss slows down and hair mass is boosted. Spray 12 times once a day, preferably in the evening, throughout dry scalp. Massage until absorbed. Do not rinse. Avoid to wash your hair, it is recommended to let stand the product at least 2 hours.